Spam: It’s a never-ending battle. Fortunately for you, the EndLayer team has compiled a list of the best weapons you can use to fight spam and win. (It sounds heroic, doesn’t it?) Find out how to escape the spammers by using disposable addresses, getting creative with disguises, and more. And stay tuned for the next half of our list: Tips and Tricks for Winning the Spam War, Part 2. Tip #1: Make sure you’ve installed effective filters. (If you’re an EndLayer customer, we take care of this part for you.) Also, make sure you check out our upcoming post on the best spam filters for Mac and Windows operating systems. Here at EndLayer, we’re pros at getting rid of spam and keeping our sites and servers ultra-secure. It’s kind of what we do. But of course, prevention is the best cure – so here are a few ways to keep spam messages from getting to your inbox in the first place. Tip #2: Use disposable email addresses. It’s a bad idea to use your real email address anywhere on the Web – spammers are just hovering around like vultures, waiting for you to post a link. A disposable address is a “fake,” disabled email address. You set it up to forward to your actual address, and wait until a spam message comes through – then you disable the disposable address, and any spam that gets sent to that address will just bounce back to the sender. You can have lots of disposable email addresses! Use one for each separate time you have to sign up for something, if you like. That way, you’ll know exactly who’s spamming you, or who leaked your address to a spammer. Tip #3: Don’t check the boxes! This is a tip that frequently gets overlooked! If you sign up for something on the Web, watch out for teeny-tiny disclaimer print that says something like “YES, I want to be contacted by select third parties about products I might like.” Usually, the little tiny box next to the little tiny print is already checked – and before you realize it, you’ve released your email address to the whole Internet. Look for the box! If it’s checked, uncheck it. And if it’s not checked, leave it that way. Tip #4: Be sneaky! Disguise your address. If you have to leave a link to your email address somewhere online – like blogs, forums or message boards – be sure you disguise the address so spammer programs can’t recognize it. The people you want to contact can see through your disguise – but the spammer robots will be fooled. For example, if your address is person@something.com, you can disguise it as person@somDELETE_THISething.com . When spambots try to send mail to that address, it will bounce. You can also use email address encoding tools like these if you don’t want to bother disguising your own address every time. Tip #5: Domain owners, this one’s for you. If you own a domain, you have an automatic anti-spam tool available: your mail server. Just create throwaway addresses at your domain: bigclownshoes@mybusiness.com, backtothefuture@mybusiness.com... You get the idea. All these throwaway domains will automatically redirect to your main (real) email address by default...but you can still see which throwaway address the spam came from. So if you get spam from your bigclownshoes address, just disable the address by making any mail to bigclownshoes bounce back to sender. There! Took care of that spammer. 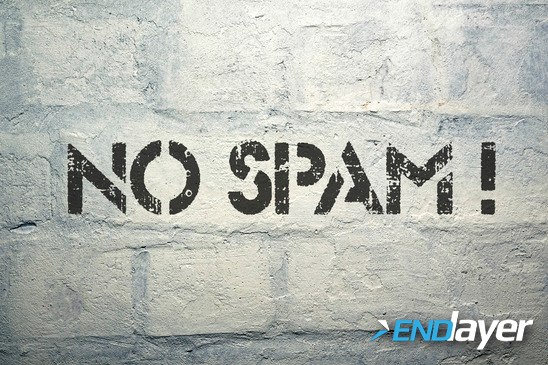 For the next article in our “EndLayer Guide to Spam” series, click here. We have more useful (and sneaky) tricks!